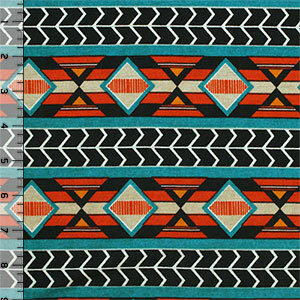 On trend colors of teal blue and orange together with black in this navajo ethnic inspired design in repeating symbol rows on a super soft and stretchy cotton jersey poly rayon blend knit. Fabric is soft with a good stretch, nice drape, and is light to mid weight. Pattern repeat measures 3 1/2" (see image for scale).